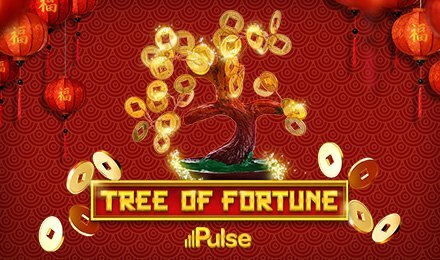 Discover the richness of Chinese culture on Tree of Fortune Slot at Moon Games! It is an iSoftbet creation packed with 5 reels and 243 Ways to win. This Asian themed slot game takes you to a different environment where you can see traditional symbols. It is set on a bright red backdrop, with the reels within a golden frame. You can see various symbols like the Golden Rooster, Golden Cat, Lotus Flower, Gold Coins, Firecrackers, A, K, Q, J, 9 and 10. Make the most of this slot at Moon Games on any device! Start your gaming experience on Tree of Fortune Slot by adjusting your stake. When your bet is placed, hit the Spin button to initiate the reels. Create combinations of 3 or more symbols on the reels to earn a win. You can also enjoy a set number of automatic rounds using the Auto Play feature. Amount of Paylines Selection: The 243 Ways to win stay active throughout the game and cannot be changed. Coin Values: The bet values range from £0.25 to £25.00. The Golden Dragon on Tree of Fortune Slot acts as Wild and appears only on reels 2 and 4. It helps to complete winning combinations by replacing any symbols, except Scatter. Scatter is represented by none other than the Tree of Fortune which helps in triggering the Free Spins Feature. When 3, 4 or 5 Tree of Fortunes show up anywhere on the reels, 15 free spins and a 3x multiplier are awarded. You also have the option to retrigger the free spins during the feature. Enjoy the Re-spin Feature after any normal spin or re-spin. Each reel which is re-spun has a specific cost as shown on each of them. Only the wins on a re-spin reel are awarded. This feature is not available during free spins. If you change the coin value, the re-spin options are cancelled for the current reels. Without delay, launch Tree of Fortune Slot at Moon Games and enjoy a good time. Good luck!